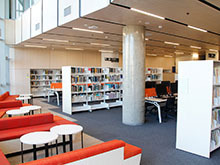 The Newcastle City campus Library in UON's NeW Space building houses a dynamic collection of high demand and core items to support the needs of staff and students located at the Newcastle City campus. The Library has group study rooms, collaborative areas, computer work stations, lounges and quiet study spaces. 24 hour common areas are available on the ground and first floors of the NeW Space building. Swipe card access is required for after hours entry. Use your UON ID card to release and pay for printing at printer/photocopiers throughout NeW Space. During Library Service opening hours find general library assistance on the ground floor of the NeW Space building as well as general and specialist support in the Library on Level one. 24 hour common areas are available on the ground and first floors of the NeW Space building. Swipe card access is required for after hours entry.